Scented tea erasers! 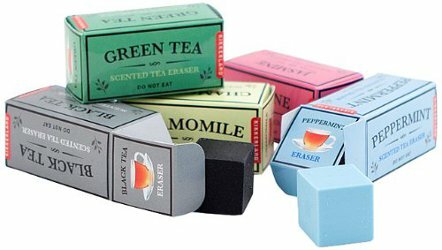 Five itty bitty erasers in green tea, black tea, chamomile, peppermint and jasmine), $4 at Kikkerland. My inner 12 year old self is lemming these like crazy. It brought me right back to my junior high obsession with miniature scented pencil case items. They are also on Amazon, for a bit more $, and the reviews of the scents are wildly varying. I have a vague suspicion that “fresh” product matters. For a moment I thought they erase tea!